Home / Sell My Home / Sell my house fast! Do you find yourself saying I need to sell my house fast? Don’t even bother getting an agent that will take commission from you and could take years to sell your house! It takes a lot of time and hassle to get the house ready for sale to most buyers, and once you get a buyer the closing process could take months, which you don’t have time for! We will get a buyer out to you in 24 hours with an offer GUARANTEED! We buy it all– Whether your house is in great shape, needs work, or is just ugly, we’ll take it off your hands. Stress from relocating for a job, avoiding foreclosure or inheriting a home from the unexpected passing of a loved one is enough to deal with. 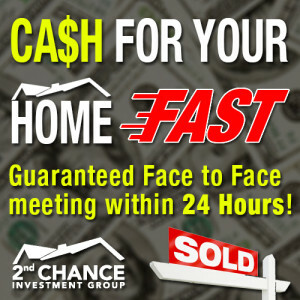 At 2nd Chance Investment Group we want to minimize that stress and give you ease of mind knowing that the daunting task of selling your house is taken care of, while you get cash in your pocket right away! Contact us today and find out why we are the best in the Inland Empire when it comes to buying your home fast with the best possible service!